In the back-office world the central concept in most of the systems is one of a Trade. A Trade has many events (e.g. Inception, Amend, Novation, Termination). Generally events from different trades can be processed in parallel because they have no interdependencies, however, events from the same trade cannot be processed in parallel due to the fact that they modify the same internal instance of a Trade. 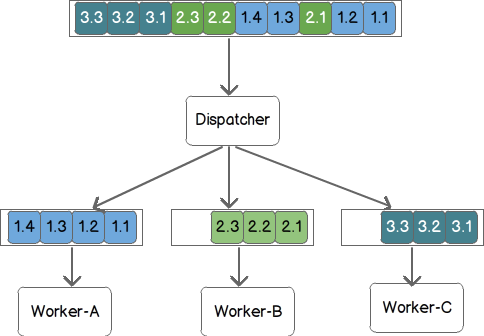 A useful pattern for this kind of scenario is dispatcher-worker with worker queues. Each worker has a job queue which it processes in a sequential fashion. Each job queue only contains events for a single trade. This allows parallel processing across trades while maintaining sequential processing on events for a single trade. I've developed simple version of this concept using Spring Integration. The first step is to create a Router that routes inbound trade events into channels that are specific to a trade. If the channel doesn't exist then the Router will create a new one and register it with the Spring framework. Finally (not yet implemented) you can run a Reaper Thread that can remove channels and consumers that have not seen activity for a specified threshold. You can also back the inbound channel with a Message Store to ensure that the system can come backup in a consistent state on failure.